Heat oven to 375°F. Spray 24 mini muffin cups and top of pans with Crisco® Original No-Stick Cooking Spray. Place 1 cookie dough round in each muffin cup. Bake 15 to 20 minutes or until golden brown. Cool completely in pans, about 20 minutes. Loosen with tip of knife; gently lift out. In small bowl, place 1/4 cup of the powdered sugar. Dip rim of each cookie cup into powdered sugar. Reserve 1 teaspoon of the powdered sugar for sprinkling over tops of tartlets. In large bowl, beat remaining 1/4 cup powdered sugar and the cream cheese with electric mixer on medium speed until smooth. Beat in liqueur. In small microwavable bowl, microwave chocolate chips on Medium (50%) 1 minute; stir. Microwave 30 to 40 seconds longer; stir until smooth. Beat melted chocolate into cream cheese mixture with electric mixer on low speed. Add mocha cappuccino hazelnut spread; beat on medium speed until blended. Spoon or pipe about 1 tablespoon chocolate mixture into each cookie cup. 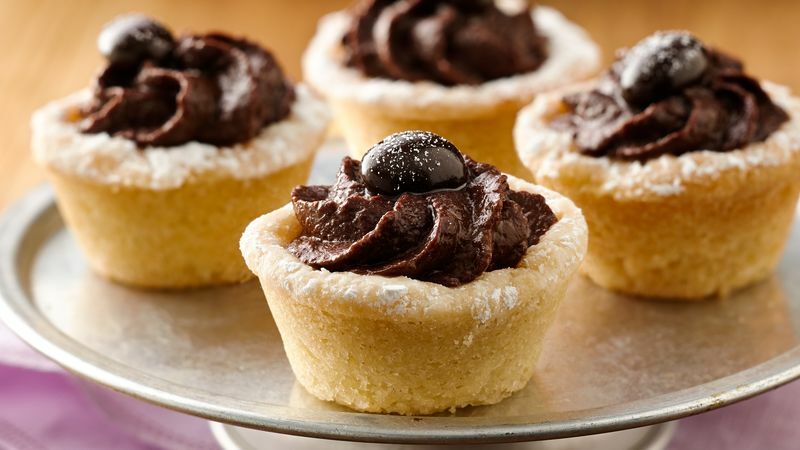 Top each tartlet with chocolate-covered coffee bean. Refrigerate until ready to serve. Before serving, sprinkle with reserved 1 teaspoon powdered sugar. Store covered in refrigerator.